artofbonsai.org • View topic - What if Traditional Bonsai Style Did Not Exist? What if Traditional Bonsai Style Did Not Exist? Post subject: What if Traditional Bonsai Style Did Not Exist? What if 'Traditional' Bonsai Style Did Not Exist? A few observations have made me to conclude that there is no such thing as THE traditional bonsai style. Traditional is used as synonym to classical very often. Let?s look at "classical" bonsai as they were shown over times. Where can we do this? Well, it can be done by looking at issues of the Kokufu-ten books over the years. If you ever have a chance to look at one from before the war it will strike you that the majority of trees shown in there don't look at all like what most see as "classical" bonsai today. In fact a majority would be considered inferior today. Then one moves on to editions after the war. One finds that in the late fifties and mid-sixties the bonsai exhibited often look like what is seen as "Classical Traditional Bonsai Style" today by quite a lot of people in the West (but not in Japan!). Going on in time the bonsai have a different feeling again. And in editions of the past ten years they look very much different again. What most would call THE classical trees is really the trees of the late seventies to end-eighties. Compared to other art forms this is very recent for being called "classical". But for some it is already dated. Look at what people create who were trained in Japan very recently. Does this look like what we have learned to be "traditional" bonsai style? Most of the times it does not. I am not even speaking of the youngsters who have studied with Kimura. And I am not speaking of those who try to be very contemporary. I am speaking of those who insist that what they have learned and what they are practising is "traditional" bonsai. I have had the pleasure to interview Kimura in public on stage two years ago. One question went into the direction "what is so different in your style than what we have learned to call traditional?" Kimura insisted that what he was and is doing is "traditional". He insisted that he is in the classical line and all there is to it is may be more attention to detail, to refinement. Well, I don't think so at all. But what is "traditional, classical" bonsai if it comes in so many radically different appearances? And it even dares to change, to progress. Traditional, classical means something stable to most. Something to look back and up to, to admire forever. How come what used to be called top classical masterpieces is changing all the time. It is not supposed to. Or is it? How come that there is definitely a different look between what is created in the West (outside of direct Japanese influence) and called "traditional" and what is coming out of Japan nowadays and also called "traditional"? I think we can see quite a few more or less radically different styles under the heading "traditional". I at least see clearly two: The Western Traditional Style and the Japanese Traditional Style. If this comes as surprise to you, you are in good company. It surprises me too. Interesting observation. It does seem that the word "traditional" is always linked to the "original" effort that is practiced over and over. It really makes me consider what traditional really defines. It appears that traditional is more of an adjective or adverb than noun. I looked it up in the dictionary and was surprised to see a variant of the word included the "passing down of information, beliefs, and customs by word of mouth or by example from one generation to another without written instruction". That seems very relevant to bonsai where we obtain so much of our training through visual reference of the subject. Being "word of mouth/example", small nuances will factor into the equation. We will see variances in the "tradition" and sub-categories will emerge. Your entry of Western and Japanese "traditional" are prime examples of that. No specific group has sole right to the term "traditional", because it is once again, more of an adverb. We incorrectly use it as a noun when we discuss bonsai. The true noun precedes the use of the word traditional. I find it very relevant to use the term "old school". It's definition is "adherence to the policies and practices of the past". This helps eliminate some of the confusion when I consider the styling variances in bonsai. I realize that "school" and the practicing of various "schools" is not synonymous with tradition. Tradition just signifies the school is something from the past. I realize that may muddy the waters further, but that is how I separate how tradition equates into my bonsai studies. I am well aware of the term 'Old School' being applied to what I call 'Western Traditional Style' or 'School'. I wonder whether I want to use that term. It is a value judgement in my opinion. It is slightly derogative in so far as it probably really means old-fashioned. Well, there are people who mean exactly that, but it would be detrimental to an intelligent discussion to see it that way. The only thing that I sometimes wonder is whether those who are doing 'old school bonsai' are aware that they are not on the cutting edge. While it is OK to do a retro, one should at least kow that this is what one is doing. I think you make a very valid point here. One should always know what they are doing. the problem is without knowledge of the "old-school", any similar result is pure luck. I for one view old-school as a compliment. Many old-fashioned ways suit me just fine and I haven't seen anything better to replace them. It means you care enough to know how it HAS been done, not necessarily continue to do it the same way, but at the bare minimum have it as a viable alternative. Many times the new techniques are solidly entrenched in the older ways. They are the foundation that we build upon. Without a solid foundation, no structure will remain sound for long. I realize that you know this very well and have for much longer than I. I do hope that as a less-experienced stylist, I can relate to others that I do not stray from traditional methods without serious thought. Too many times we jump on the "new" bandwagon just because it is different. Not necessarily better, just different. I find that more common with those who are younger and/or less-experienced. Almost as though we must have a unique way. Personal flair is great, but vanity can be a terrible curse. The greats find a way to balance all the attributes and minimize the faults. Therein lies the paradox. The best will always find a way, but I dare say all of them know the paths taken by those before them. It's amazing how many times we tread the same worn path. Great post and lots to think about. Thanks for the contribution. Very good post, and I hope that it clears up some confusion with these things that develop as I study such things. When I had first studied the history of Bonsai, I thought to myself, that the Chinese way of things will be the 'classic, traditional' way of doing things, so I studied that. As studies deepened and I had more conversation with artists, I began to think that the Japanese way must be the 'classic, traditional' way of it. Then even further I discovered that there were yet more artists that seemed to be pushing the rules a little further. The more I studied, the more confused I got, and I started to see definate differences between Chinese, Japanese, U.S. and European bonsai. At that, was when I stopped studying 'traditions,' or 'schools' and started studying only certain trees, both in nature, and potted. After hundreds of sketches I began to see what attracted me, and what influenced my way of bonsai design, and I thought it was far from 'traditional.' This of course led me back to more study of the 'old school,' and after seeing the book Classic Bonsai of Japan, I am once again studying this very topic. Interesting post indeed, I have found myself thinking of your statements quite often, trying to sort out my impressions on this subject. I have always considered classical bonsai as being such that strictly follow the "rules." In this sense, it is not the bonsai that are classical but the "rules" themselves. However, as you have pointed out quite well, bonsai has evolved over time and continues to do so. Picking one point in this evolution to be called classical is difficult if not impossible. It would be interesting to know what drives these changes over time. What makes an artist create horizontal, flat foliage pads with empty spaces between them, and then fifteen years later change into multi-directional, much more round pads with little or no space inbetween. If nature is the inspiration, does our interpretation of nature change over time, or simply peer pressure to do the "right" thing? Are we just trying to follow the mainstream and please the judges to win awards and recognition? If today someone creates a tree that looks like one of those pre-war bonsai, he will be told that this style is outdated, and therefore there will be pressure to change it into a modern-looking one. Once the change is done, everyone will be pleased that now the tree looks like "it is supposed to look". So, the current, maistream style is preserved and no tree looks "out of style". I know there is no simple answer to these questions, but it's interesting to look behind the socio-cultural forces that shape today's bonsai. We think that we have a free choice as to shaping our bonsai, but this freedom may just be an illusion due to strong pressures keeping us within the accepted norm. I bet we are not even aware of those pressures for the prevailing tastes are so deeply ingrained in us that we are on automatic pilot. I hope you don?t mind, but I want us to get away from misusing terms like ?traditional,? lest we unnecessarily complicate and mischaracterize these issues. Only those individuals who have enrolled themselves into, practice, and maintain the craft and techniques of a specific line (tradition) of teachers are practicing traditional bonsai. Everyone else is just practicing their own brand of bonsai. Traditional has nothing to do with how something looks, only with how something maintains a specific tradition. Yes, I know that people commonly use the term ?traditional? to describe things that are similar to standards or practices from the past. But this is only true of things that have no actual tradition. Bonsai does, however, and we shouldn?t lose sight of that. What you cite regarding the evolution of bonsai quality from the 1940s to today has mostly to do with improvements in craft and the emphasis on artistry. The craft and technique has improved greatly over the past 5 or 6 decades. These advances made and continue to make a significant difference. Also, not so long ago bonsai was not an art form and bonsai were not treated as objects of art. Today, bonsai can be considered an art form and bonsai displays are often efforts at artistry. This also makes quite a difference. I really don?t understand your question of, ?But what is ?traditional, classical? bonsai if it comes in so many radically different appearances?? Of course it does! That?s because there are so many different artists and so many different aims and approaches to specific works. Why is this even an issue? You also ask, ?And it even dares to change, to progress. Traditional, classical means something stable to most. Something to look back and up to, to admire forever. How come what used to be called top classical masterpieces is changing all the time. It is not supposed to. Or is it?? There is nothing inherently stagnant or backward about tradition. Traditions evolve and improve ? else they die! This is one reason why traditions are so important: change and innovation is arrived at smoothly and in the proper context, rather than haphazardly and with no reference to the fundamentals. Perhaps your questions are rhetorical and you?re only asking to see what response you get ? so you can correct someone, but even so you are (mis)describing a problem that is not an issue for our endeavor. Why? As for your question for why bonsai created in the West and in Japan differ so much, the answer lies with tradition. Japan has some strong traditions and, therefore, some strong work and a high degree of excellence. There are few traditions in the West and they are almost entirely frowned upon. In Japan, when someone is a singularly excellent artist, his students will carry on his tradition. In the West, this artist?s excellence dies with him. Sad. congratulations for seing that my observations are stating the obvious. My experience on travels to many parts of the world is that there are about one hundred thousand bonsai practitioners who do not have your clear view. They 'know' what traditional bonsai is and they think they are practicing traditional Japanese bonsai. And they 'know' that it is a century old art if not millenia old and that there is only one traditional school. As I am suggesting here with agreement from others 'traditional' bonsai is a moving target, which comes as a big surprise to just about everyone who finds out about it. But not to you, I understand, and it is alrirhgt with me. So it is not relevant that there are so many 'traditional' styles in parallel while we were lead to belive that theer is only one and it is written in stone? Well to me it makes a big impact. You are not teaching as much as I do. I can tell you it makes the hell of a difference to me. I say what I have to say. Quite few are being extremely offended by the mere suggestion that they do not own the ultimate truth, that there are many truths out there. The notion that what is being practised as 'traditional' bonsai in the Western world is mainly a snapshot of the state of the art in a couple of nurseries in Japan in the late 1950ies to mid-60ies is blasphemie to some. So why are we not taking THE standard Japanese book about the art of bonsai and find out about this? Most intersting observation again: it does not exist! While there are several great standart textbooks in the west which have made bonsai in the western world what it is today there is not a single Japanese book that comes close to this. BTW: In America the word 'liberal' has become a curseword in many circles. In Europe among intellectuals the word 'traditional' has just as much negative meaning. The very last thing a European intellectual wants to be called is traditional. This may be one explanation why it seems that Europeans have no problem at all to ignore bonsai tradition or what they are told is bonsai tradition. If they do not value their own traditon why should they value somebody elses? Hah, flattery will get you nowhere. ;-) Yeah, I knew you were stirring the pot a bit. I felt silly replying "to" you with this, as I know you know this stuff. I find it disappointing that you don't meet many others who have an appreciation for truly traditional concepts. Of course I was generalizing quite a bit when I referred to what happens in Japan with traditions and what happens in the West with (the lack of) traditions. There are examples of either case on both sides of the world. I think that it sets a good example that one actual tradition here in the U.S. clearly shows the value of traditional bonsai. Boon Manakitivipart is part of a strong tradition that he has continued here - and his students clearly exemplify the benefits of that tradition. It is a tradition of excellent bonsai craft and art. Worth thinking about. It is worth noting that since in Europe the term "tradition" is unpopular (to say the least), top European artists who did study in Japan under reputable masters are reluctant to talk about the particular tradition that their teacher represents. A young italian artist comes to mind (whom we all know). I watched him work and talk a little while ago at a convention. He loved to talk about being creative,original, and breaking rules, but never mentioned anything about the importance of tradition he studied under. He certainly relies on that tradition every day, but never talks about it. It's just not something that the participants in the European art scene would be too excited to hear about. The paranoia of conformity may be the reason behind it. I second that. When I said that some who come back recently from Japan doing 'traditional' bonsai that look very different from what so many in the West think 'traditonal' bonsai are suppsoed to look like, Boon was on my mind among others. Well, Boon, as far as I am informed, claims to practise traditional bonsai. Yes, he sure does in my opinion, he pracises by and large what I would call 'Japanese Traditional Bonsai'. It could also be called 'Modern Japanese Bonsai', some call it 'New School'. I think that what came aftter Kimura and what is becoming mainstream in Europe is quite different from this 'traditional' schoold and could well be called 'Modern Bonsai Style'. At least this is what I call it now more and more because I think it adds clarity to this chaos. It does not matter that Kimura himself claims to practise 'traditional' bonsai. The reason may well be that in the Japanese culture one HAS to claim to stick to traditon while being a revolutionary. In the West, at least in Europe one proudly claims to be a revolutionary while sometimes one is just following old traditions. Some people say 'Contemporary Bonsai' and mean a few things at the same time. I think they usually mean something that is quite different from the Western Traditional Style. They mean Boon's style among others and they mean Erine Kuo and Marco etc. But the term 'contemporary' simply means that something is done here and now. Well, this could be any style. So I think the term 'contemporary' should be avoided in this context. This is as far as I have thought this through in the past months. It is not meant to be a value judgement or call for a revolution; it is meant to be a system to describe what is happening anyway. Last edited by Walter Pall on Fri Dec 30, 2005 1:26 pm, edited 4 times in total. I think this is a cultural clash between Est and West. In the East to be a great artist means to be great in a given school, to perform the best according to the rules of that school. The best student is the one who can copy the master so well that not even the master can tell the difference. A 'revolutionary' is one who escapes these chains. He is NOT in general a hero, he is an outcast. And thus revolutionaries claim to be part of the system still when they are not so. Good art in the East is good copying. The Eastern artist it trying very hard to stay in mainstream. In the Eastern model the school is more than the individuals practising it. The Eastern bonsai practitioner is proud to be a good craftsman. Italians have more or less invented this Western model of arts in the Rennaissance. Many Italians still think that they are born artists. They certainly mean the revolutionary type. This is, of course, painting black and white, but it would explain a few things which are going on in the bonsai world. One thing I do not understand here. If the above is a good clue to what is going on, why is it that the overwhelming majority of American bonsai practitioners seem to cling to the Easten model? I was brought up in believing that America is the land of the free, the land of the people who ask 'why not? ', the land of the revolutionaries. Well, yes in arts in general yes, for sure! Why not in bonsai??? What I like about this is that although various differences exist, no one is claiming a certain technique is better. They are just different means to an end, so to speak. There is value involved in every one whether we personally practice it or not. As for myself, I do not think I am at a point where I am consistently considering only one school of thought when it comes to bonsai styling. Probably the trait of someone who is still somewhat hesistant. I do know that I prefer bonsai that permeate with an air of naturalness. More abstract attempts can interest me, but more often than not, they don't. Still, I never rule it out that some material is destined to be styled in a way I do not yet understand. I guess that is my way of trying to mature into an appreciation of what I do not quite agree with. I find it inspiring that so many different artists with highly contradictory styling techniques still respect the work of others. That is why, in my opinion, bonsai is in such a greatly improving transitition, and I believe that while it will always have Chinese and Japanese origins, the endeavor has now received world-wide acceptance and appreciation. Now it is up to us to continue to make it evolve in a positive way. Good art in the East is good copying. Conforming to the tradition of a certain school is certainly part of the Eastern way of practicing art. However, since I am an avid admirer of Japanese and Chinese landscape painting, I can tell you that there is a treasure trove of brilliant works out there that nobody can accuse of being copies of anything. The composition, colors, the ingenuity of discovering beauty in everything we encounter on a daily walk through a small town - the talent of this artist to transport us into his world of wonderment is simply magical. 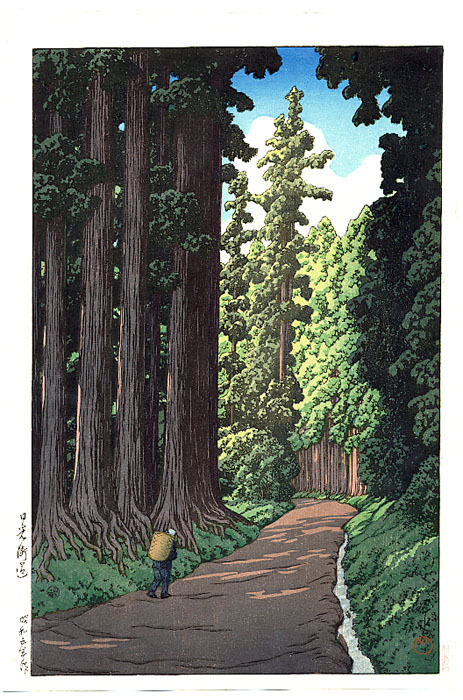 Take a look of Hasui's gallery, by clicking on the individual works. Would you call him a craftsman who just copies the works of his teachers? Or calling all Eastern artists just craftsmen may be the result of stereotyping and oversimplifying the truth. BTW, you may recall that Van Gogh was so fascinated by the uniqueness and originality of Japanese woodblock prints that he copied himself Hiroshige's work (one that shows a bridge in the rain, if I remember correctly). Last edited by Attila Soos on Fri Dec 30, 2005 5:33 pm, edited 2 times in total.